Marked by the type of old fashioned gravitas that fuels many classic IMAX films and special theme park exhibitions, 'Ocean Men: Extreme Dive' offers a stirring look at the ocean's depths, as seen from the perspective of two determined men who share a passion for the sea. Through awe-inspiring underwater images and rapturous music, the documentary overcomes a thin narrative and short running time, immersing audiences into the deep blue's ethereal splendor. Focused on the dangerous sport of competitive free diving -- where participants dive as deep as possible on a single breath of air -- the documentary follows Pipin Ferreras and Umberto Pelizzari, two divers with opposing philosophies, as they each attempt to break records. Ferreras adheres to the no limits strategy of diving, using a weighted sled to submerge himself to otherwise impossible depths. On the other hand, Pelizzari follows the constant weight technique, where he uses only his own body and weight to dive. After training mentally and physically for their dangerous record breaking attempts, both men brave the ocean's depths as they attempt to make history. In a grand, dramatic style, the film covers its subjects through narration, archive video, reenactments, wide aerial shots, and breathtaking underwater footage. Voiceovers from the divers and an omniscient narrator provide background information about the sport, briefly clueing us in on the history of free diving and guiding us through the athlete's rigorous preparations. Likewise, some archival clips help to set the stage, and well produced dramatizations of the divers' early years lay down some quick backstory for their motivations. Though the doc's runtime is short (40 min), the filmmakers do a solid job of cramming in all the necessary information without making the movie feel rushed or incomplete. As we hear Ferreras and Pelizzari discuss their passion for the sport and their specific strategies, we are treated to gorgeous footage of the divers exploring the ocean. These underwater sequences are simply stunning, and the IMAX photography is dreamy and hypnotic. Shrouded in darkness, save for the sun's ethereal rays of light shimmering from the surface, the visuals are mysterious and almost otherworldly, capturing all of the majesty of the sea, while fully engrossing the audience in the divers' world. One particularly impressive, seemingly unbroken shot follows Pelizzari as he briefly disappears into a dark underwater cavern, only to reemerge with two dolphins swimming in tandem by his side. It's a truly remarkable sight, further reinforced by a stirring musical score that perfectly complements the visuals. In fact, it's so incredible, that I can't help but suspect that some kind of cinematic trickery was used to accomplish it. Once the training is complete, the doc follows each diver individually as they attempt their record breaking feats. These sequences are all shot and edited with solid tension, building up anticipation for their success or failure while fully immersing the audience in their head space. Watching both men slowly drift deeper and deeper as the music swells is riveting, and their eventual triumphs or defeats are appropriately powerful. With that said, though satisfying, by the time the credits role, one is left feeling like we've only scratched the surface of the sport and its subjects. 'Ocean Men: Extreme Dive' is a classically produced IMAX documentary filled with mesmerizing underwater footage and rousing music. While the approach can be a little overly dramatic, and the short runtime is a bit thin on details and overall story, there is such incandescent beauty in the film's images that they more than make up for any other shortcomings. Through impressive cinematography, the director captures the radiant splendor and unknowable mystery of the sea, giving visual form to the passion that attracts both divers to their dangerous goals. While the doc might not fully succeed as a detailed examination of free diving, it works surprisingly well as a more visceral and dreamy distillation of what makes the sport so appealing. 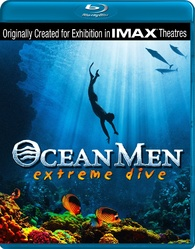 Image Entertainment brings 'Ocean Men: Extreme Dive' to Blu-ray on a single BD-25 disc housed in a keepcase. After some logos and warnings, the disc transitions to a standard menu. The packaging indicates that the release is region A coded. It should also be noted that I ran into a slight hiccup when initialing loading the film. At first the disc repeatedly attempted to download an update and would not load. However, stopping the disc and trying again resulted in a successful start up. The film is presented in a 1080p AVC/MPEG-4 transfer in the 1.78:1 aspect ratio. Originally shot for exhibition in IMAX theaters, the image is simply breathtaking with lots of awe-inspiring underwater footage. The print is in good condition, with a very light layer of grain, but there are some minor specks here and there. Clarity is exceptional whether on land or sea and the film's gorgeous cinematography really dazzles in high definition. One can make out every bubble or tiny drop of water and various aerial views of oceans and shorelines are mesmerizing with life-like dimension and detail. 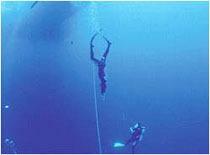 Of course, the underwater footage is the real highlight, and these sequences are astonishing. Majestic and ethereal, the image comes alive with beauty and depth and the way the sun's rays of light sneak in through the surface is particularly striking. Colors are warm above the water and cool below with strong saturation and pop. Contrast is even and steady with deep blacks. The only real downside to the image is some banding and fleeting shimmering. With incredible underwater footage and equally impressive aerial shots above the sea, 'Ocean Men: Extreme Dive' features exactly the kind of grand visuals one would expect from an IMAX film. Though there are some very minor artifacts, this is an otherwise exceptional image. The movie is provided with an English DTS-HD MA 5.1 track and a French DTS-HD MA 5.1 track with no subtitle options. Serene and dramatic, the mix features stirring music and immersive effects, submerging the audience into the ocean's depths. Narration is crisp and full-bodied, giving commanding presence to the informational voice-overs. Subtle and aggressive effects work together to create an enveloping soundfield, using rhythmic breaths and waves to immerse the listener into the echoing ocean atmosphere from all sides. Everything from delicate bubbles and dripping waters, to loud, life affirming gasps for air come through with great range and fidelity. Directionality and imaging are smooth and organic, and low frequencies pack a strong punch. The film's music is also quite impressive, and the mixture of calming melodies and grandiose cues help to create a powerful mood that's spread throughout the room with distinct separation. Like the visuals, the audio enhances the mystery and beauty of the ocean, enveloping the listener with deep effects work and inspiring music. Sadly, outside of some trailers for other releases, there are no special features. 'Ocean Men: Extreme Dive' is a stirring IMAX documentary that captures the mysterious beauty of the ocean through the dangerous sport of free diving. Though the film is a little lacking when it comes to narrative and the runtime is very short, the visuals are simply breathtaking. The video transfer is exceptional, showing off all the gorgeous underwater cinematography, and the audio mix is immersive, surrounding the audience with rousing music and effects. Unfortunately, there are no special features. Though short and barebones, the film is surprisingly engrossing and the technical presentation is exceptional. This release is definitely worth a look.